Iran's president has called on the committee vetting candidates for next month's parliamentary elections to allow more reformists to stand. 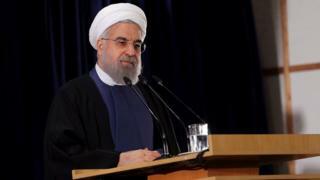 In a televised speech, Hassan Rouhani said parliament was the "house of the people, not a particular faction". Elections would be pointless if there were "no competitors", he warned. His comments came a day after nine factions said the Guardian Council had approved only 1% of the reformist candidates who had registered to run. Many were disqualified because they were not considered sufficiently loyal to the ruling system by the committee, which is made up of six judges elected by the conservative-dominated parliament and six clerics appointed by the Supreme Leader, Ayatollah Ali Khamenei. Almost 12,000 people applied to stand in the elections on 26 February for Iran's 290-seat parliament and 88-member Assembly of Experts, the body that will pick the country's next supreme leader. Some conservatives were among the 7,300 candidates who were disqualified by the Guardian Council. But reformist factions, who favour more political and economic freedom, said they were overwhelmingly targeted, with only 30 of their 3,000 candidates approved. "This is the biggest number of disqualifications in [Iran's] history," said prominent reformist Hossein Marashi on Wednesday. But he added that reformists did not plan to boycott the elections, vowing: "We will stay to fight because we don't want extremists to grow." Reformists have been largely sidelined since the authorities launched a crackdown on the opposition Green Movement following the disputed presidential election in 2009, and few contested the last parliamentary polls in 2012. But their hopes were raised by the the election the following year of Mr Rouhani, a moderate cleric, and his success in negotiating a landmark nuclear deal to get international sanctions lifted this month. In his speech on Thursday, the president called for "healthy competition" in the forthcoming elections. "We must create hope, enthusiasm, competition," he said. "If there is one faction and the other is not there, they don't need the 26 February elections - they go to the parliament. "No official without the vote of the people would be legitimate." He also noted that religious minorities were accorded seats even when they made up only a fraction of the population. "Yet there is a faction in this country with seven or 10 million [supporters and few seats]," he added, alluding to reformists. Mr Rouhani said that he had assigned Vice-President Eshagh Jahangiri to discuss the disqualifications with the Guardian Council. The head of the committee, Ayatollah Ahmed Jannati, has said its members "will not be influenced by pressure". But his deputy has also noted that up to 15% of those disqualified from running are likely to be reinstated during the reviewing process. A final list of approved candidates will be published on 4 February.